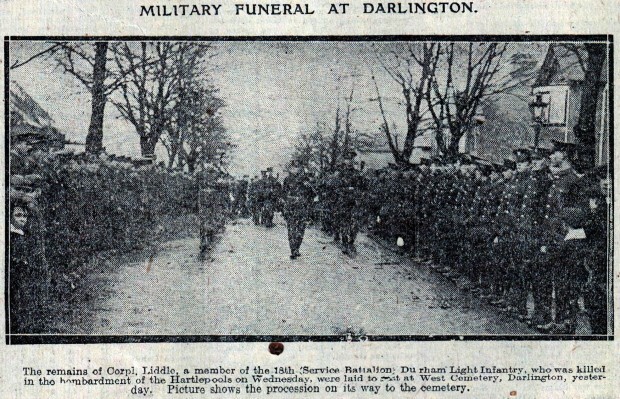 A Christmas card begins the tale of one of Darlington’s sons, who became the first British soldier to die on the mainland in the First World War. I hope you spend a HAPPY XMAS. I wish I was coming down to Clacton next summer but I am afraid it is rather too far. Don’t be like Rosy, getting drunk on rhubarb wine. AT first glance, this is a chatty festive greeting that was sent by a young man in the days before Christmas cards had robins and reindeer sprinkled all over them. But exactly ten years after he posted the card, the young man who signed his name in black ink at its foot had become one of the first British casualties of the Great War. Corporal Alix Oliffe Liddle was one of the first soldiers to be killed in battle on the British mainland in 200 years. And he died in one of the notorious incidents of the war – the bombardment of Hartlepool. In 1904, when he sent the Christmas postcard, Alix was 15 years old, and he lived in Hummersknott Lodge in Carmel Road, near West Cemetery. There was a picture – taken by Alix himself – of the lodge on the front of the card . The house still stands today, though greatly extended. Alix’s father, James, was born in Sadberge and for most of his working life was the coachman for the Peases of Hummersknott, the mansion which is now at the heart of Carmel School. 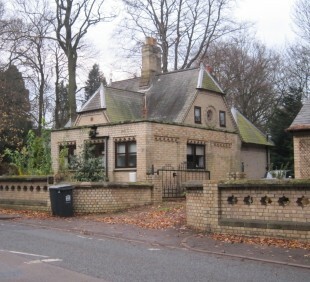 The buff-coloured bricks of the lodge indicate that Alix’s home was a Pease estate property. 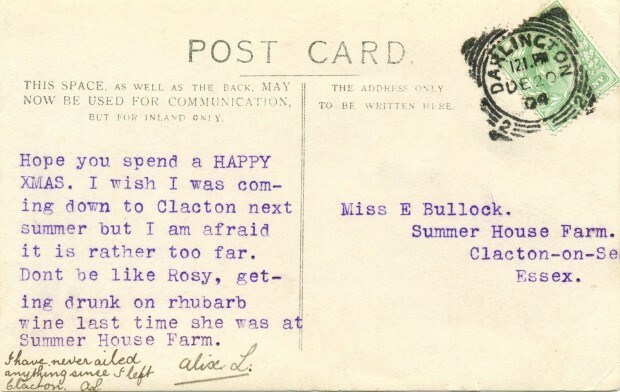 Alix’s mother, Frances, was born in Colchester, Essex, and so we guess that Miss Edith Bullock, to whom he sent the Christmas card in Clacton-on-Sea, Essex, was a relative. It is one of Alix’s sisters, Rosy, who got drunk on rhubarb wine. OVER the next ten years, Alix grew up. He got a job as a clerk in the accountants’ office of Pease and Partners, the company which controlled nearly all of south Durham’s coal mines. His desk was almost certainly in Northgate, next to Next, where the Cornmill shopping centre is now. In the 1911 census, independent Alix, now 22, had moved out of the lodge and was boarding with Mary Brownless, a widow, in Elms Cottage. And on April 27, 1914, Alix got married at Holy Trinity (the 175-year-old church that featured on the front of last week’s Memories). 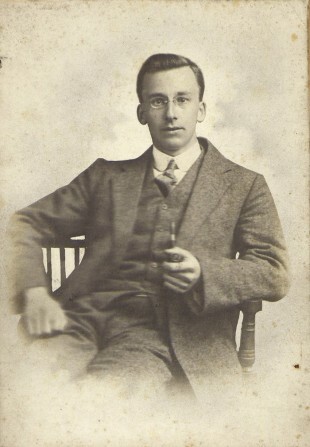 His wife was Clara Main, the daughter of an engineer, and they went to live in Sylvan Grove, a leafy little street off Linden Avenue in the heart of Darlington’s West End – this son of a domestic servant was moving up the social scale. The newlyweds, we imagine, were blissfully happy. But their happiness did not last long. Three months later, Britain declared war on Germany. Lord Kitchener, the Secretary of State for War, called for volunteers to fight. In August 1914, he introduced “pals” regiments so that groups of friends could join en masse. Darlington appears to have been one of the first 50 towns in the country to muster its own regiment, with the first 65 volunteers marching through the town centre to hearty public acclaim on September 4. 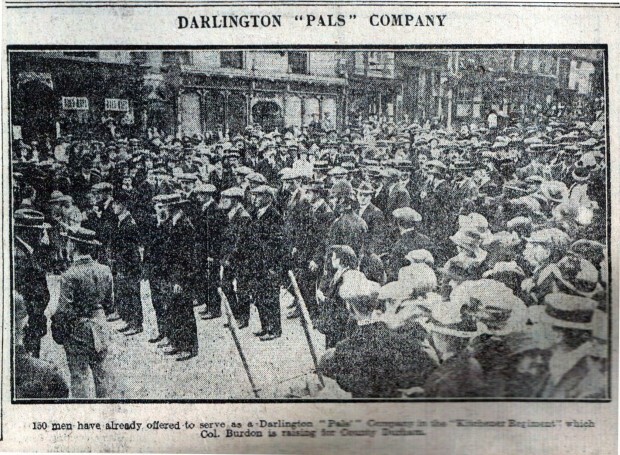 The Darlington Pals joined the Durham Pals and went off to the east coast to guard against invasion. Alix, now 25, may well have been among this first contingent of volunteers. He was certainly among the first contingent to die. . .
AT 8am on Wednesday, December 16, 1914, three German warships appeared out of the mist shrouding the sea off Hartlepool and, from a mile out, opened fire. It was a brutal exercise by the Germans to frighten complacent British civilians, who believed the war would be concluded in their favour by Christmas. 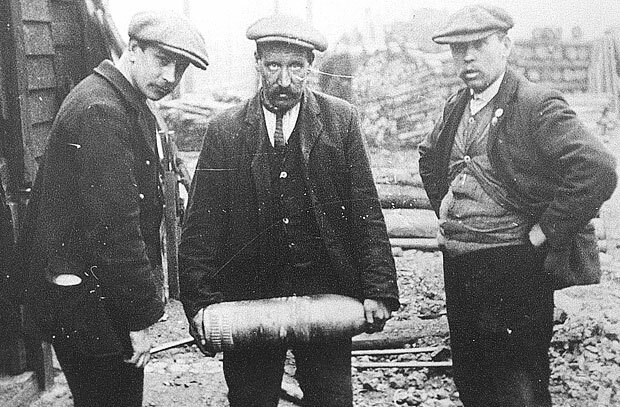 The first shell, fired by the flagship battle cruiser Seydlitz, landed beside the Heugh battery on the Headland and killed four members of the Durham Pals outright. They were, in alphabetical order, Privates Charles Clark and Theophilis Jones, both of West Hartlepool; Corporal Alix Liddle, of Darlington, and Private Leslie Turner, of Newcastle. 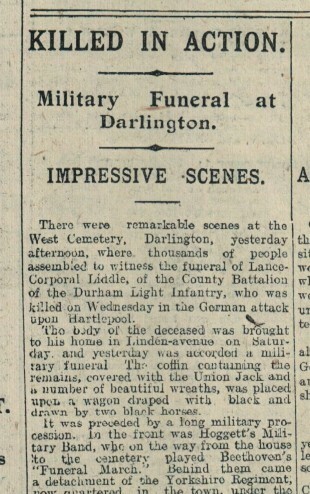 The Ministry of War, also fighting the propaganda war, decided that Pte Jones, 29, was officially the first soldier to die, perhaps because he was an assistant headteacher in West Hartlepool and only the callous Hun would chose to wipe out such a valuable and honourable man on his own soil. A plaque now marks the spot where he fell. More likely, the truth is that all four, including the colliery clerk from Darlington, died simultaneously. First, second, third or fourth, it matter not to Clara back home in Sylvan Grove. The following morning she received a telegram – “official intimation from the War Office” – saying Alix had been killed in action. After eight months of marriage, she was a widow. Alix’s body arrived at their home on the Saturday; his funeral cortege set out from there the next afternoon. “The coffin containing the remains, covered with the Union Jack and a number of beautiful wreaths, was placed upon a wagon draped with black and drawn by two black horses, ” said The Northern Echo. Hoggett’s Military Band followed, playing Beethoven’s Funeral March, and then came the Pals, their arms reversed in respect. The procession did not have far to go to West Cemetery – it may well have passed Hummersknott Lodge, Alix’s childhood home – and the streets were lined with thousands of people. “On reaching the cemetery, where a great crowd had gathered, the troops opened out and lined each side of the way to the cemetery chapel, ” said the Echo. His family – widow, mother, father, in-laws, brothers and sisters, including Rosy who hopefully had not been fortifying herself on rhubarb wine – led the way, watched by a variety of Peases, aldermen, councillors and the mayor. The vicar of Holy Trinity conducted a brief service and, in the distance, the bells of St Cuthbert’s tolled – Alix was a campanologist there. “The scene at the graveside was an impressive one, ” said the Echo. “The troops had been drawn up surrounding the grave in the form of a square, with the firing party at one side, and the bugle band at the head of the grave. “The mourners gathered around the grave inside the square, while thousands of people gathered in a great crowd outside the military and stood, many of the men reverently uncovered, while the last rites were being performed. The paper cannot have conceived how much more carnage lay ahead for King and country in the next four years. WE are hugely indebted to Colin Bainbridge of Darlington for lending us Alix’s 1904 Christmas card, and for doing much of the research for this extraordinary story. Are you a Liddle, or descended from Liddles? Alix’s brothers were Sidney, Bertram, William and Arthur, and his sisters were Frances (married name Gainforth), Winifred (married name Bailey) and Rosy (unmarried, but she undoubtedly toasted the others with rhubarb wine). And what became of Alix’s young widow, Clara (maiden name Main)? There is also a Middleton Tyas connection to this story that we don’t understand, and we don’t know where Elms Cottage was. If you have any information about Alix, who gave his life 99 years ago on Monday, please get in touch. THE bombardment of Hartlepool killed about 123 people. At the same time, German warships targeted Scarborough and Whitby, further down the coast, taking the death tally that misty morning to nearly 200. Previous Memories articles about the incident can be found here at thenortheastatwar.co.uk. AS well as killing four soldiers, Seydlitz’s first shell injured several others who cried out in agony. Other soldiers rushed to their aid. Seydlitz’s second shell landed practically in the same place as the first beside the Heugh Battery, killing four men who had gone to help their colleagues. They were Gunner William Houston, who was born in Middlesbrough; Gunner Robert Spence, born in West Hartlepool; Private Thomas Minks, from Middlesbrough, and Private Walter Rogers, the son of Arthur and Isabel, who was born in Bishop Auckland. Pte Rogers, 25, enlisted in the Durham Pals in Spennymoor and is buried in Bishop Auckland Cemetery. If anyone has more information on him, we’d love to be able to tell his story, too.